MOSCOW (Sputnik) – London is seeking to introduce new EU sanctions against Russian high-ranked intelligence officials allegedly involved in the poisoning of Russian ex-GRU officer Sergei Skripal and his daughter Yulia with a nerve agent in the UK city of Salisbury in March, The Times reported. The draft list of individuals who might be targeted by the restrictions includes members of the GRU leadership, the newspaper reported. London was seeking to introduce sanctions against these individuals under the new Brussels’ mechanism for punishing perpetrators of chemical weapons attacks, the outlet added. The Times also added that the United Kingdom was hoping to receive the support of France and Germany for introducing the new sanctions. In addition, London was also calling on other foreign ministers to approve the freeze of assets and travel restrictions for the individuals in question within weeks, the outlet pointed out. In October, UK Foreign Secretary Jeremy Hunt held a meeting with Hungary’s minister and other states’ diplomats in London to discuss the sanctions, the newspaper added. The sanctions list, including five to six names, may be published in December, according to the outlet. The Salisbury poisoning incident has provoked an international scandal with scores of Russian diplomats expelled from a number of EU states. Moscow responded by expelling UK diplomats from Russia. London has blamed the Salisbury attack on Moscow but Russia has denied any involvement in the incident, noting that no proof of its role has been provided. The UK authorities subsequently said they had identified Russian nationals Alexander Petrov and Ruslan Boshirov as the suspected perpetrators of the attack on the Skripals. However, London has not provided any evidence of these individuals' involvement in the case. 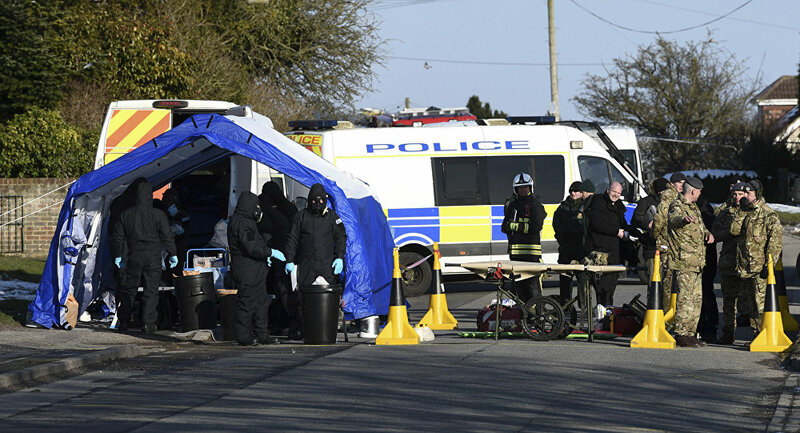 UK Prime Minister Theresa May argued that the Russian military intelligence service, also referred to as the GRU, was behind the poisoning. The two Russian nationals have said in an interview with the RT broadcaster that they visited Salisbury on the day of the attack for tourism purposes. They also denied any involvement with the Russian military intelligence. Moscow, on its part, has said that it sent dozens of requests to London asking that it be granted access to the investigation into the poisoning incident. Moscow has also offered to work together with London and carry out a joint investigation. London did not respond to these proposals, instead claiming that Russia rejected its calls for cooperation. Moreover, the UK Porton Down laboratory has said it was unable to confirm that the substance used in the Salisbury attack was produced in Russia. Russian Foreign Minister Sergey Lavrov has said that the Salisbury poisoning case was falling apart due to the lack of proof of Russia’s involvement in the attack on the Skripals.